Veritas Medical Solutions designs and develops radiation-shielding materials and shielding systems for radiation therapy treatment rooms. Now it's directing its latest development at improving the patient experience with SmartVue Natural Light Windows for shielded bunkers. The new windows also save space. "In typical radiation treatment rooms, the walls can be 4 to 8 feet thick—or thicker if they're made out of concrete," says Veritas CEO David Farrell. "We developed systems with ultrahigh-density and high-attenuating shielding materials that will contain the radiation using only about 1.5 to 2 feet of shielding material instead of 4 to 8 feet of concrete." Thinner shielding walls mean a more compact footprint, which returns space to a hospital and allows the additional room to be used for other patient services, Farrell explains. That saved space actually helped with Veritas' latest attempt to improve the patient experience of radiation therapy rooms. In pondering the possibilities and complexities of introducing natural light into radiation therapy treatment rooms while sufficiently addressing the issue of radiation containment, Farrell and his team at Veritas worked to find a way to utilize the space saved with their radiation shielding walls to bring this possibility to light. What they came up with is a product that not only brings natural light but also a bit of the outdoors into the radiation therapy room: SmartVue windows. "We realized that we could actually utilize that space and box in an area to create a healing garden," Farrell says. 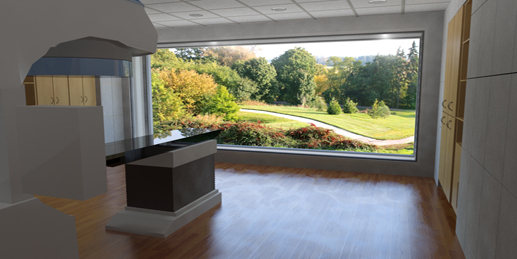 With SmartVue windows, radiation treatment rooms can have windows to the outside world, with the goal of offering patients a more natural, and potentially hopeful, experience—both before and after treatment. Recently on display at the American Society for Radiation Oncology (ASTRO) annual meeting in Boston, the product allows patients to look through a full floor-to-ceiling window as they walk into the radiation therapy room. "The product unveiled at ASTRO is roughly an 8 foot wide window that is part of the treatment room itself," Farrell explains. "As the patient walks into the treatment room, it offers them a truly unique experience as they have natural light pouring into the room and a beautiful garden outside the room that they're looking at." Whereas walking into a radiation therapy treatment room can typically feel akin to walking into a bunker (because of all the measures taken to contain radiation), Farrell explains that these windows were Veritas' attempt to take an obviously stressful situation for patients and hopefully offer a bit more comfort. How does it work? As Farrell explains, the windows themselves are glass on either side of an approximately 1.5 foot cavity space. As a patient walks into the treatment room, they see the window and can look through its clear glass windows to the outdoors. Then, as the patient is being assisted onto the treatment couch and the lights dim, the windows tint, or "frost over"—both inside and outside—allowing for a proprietary shielding barrier to move into position to contain the radiation. "The patient never has the experience of seeing the barrier closed and neither does the technician," says Farrell, noting that the windows can offer benefits to not just patients but also staff. "As the patient gets off the couch and the technician opens the doors to the treatment room, the window barrier opens and the glass windows unfrost at the same time. The experience for the patient is only to see the great outdoors and the garden area." As SmartVue officially launched at ASTRO, it hasn't yet seen full implementation in hospital sites, though Farrell says he's received positive feedback from hospital systems thus far. The first center to start using SmartVue windows, according to Farrell, will be a large, New Jersey-based facility. Farrell is quick to note, however, that the product isn't just applicable to large hospital systems but is designed to accommodate small private clinics as well.